radiosurgery/SABR as natural partners for combination regimens with immunotherapy. 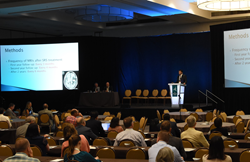 The Radiosurgery Society (RSS), a non-profit medical society dedicated to advancing the science and clinical practice of radiosurgery, announced today highlights from its annual scientific meeting, “SRS/SBRT Scientific Meeting 2016 - Bridging the Gap: Advancing Research and Education”, which was held June 16-18, 2016 at the Hilton Lake Buena Vista in Orlando, Fla. This year’s meeting was attended by more than 400 participants, including radiation oncologists, neurosurgeons, medical physicists, oncologists, nurses, dosimetrists and health industry leaders from around the world, and featured more than 100 presentations dedicated to stereotactic radiosurgery (SRS) and stereotactic body radiotherapy (SBRT). Abstracts of these presentations are now available online via the RSS Channel on the Cureus Medical Journal of Science: http://www.cureus.com/channels/therss. There were several important physics presentations on normal tissue complication probability (NTCP) for SBRT, which were recently published in Seminars in Radiation Oncology: http://www.semradonc.com/issue/S1053-4296%2816%29X0002-1. "The NTCP for SBRT issue of Seminars is the best summary of current SBRT dose tolerance data that I have seen,” said Bahman Emami, M.D., Loyola University Hospital, Ill. “Knowing that there are issues with the models, this is the best analysis currently possible from the available data, subject to the discretion and responsibility of clinicians when these results are used, as we continue to research improved models." The 2017 RSS Annual Scientific Meeting will be held November 2-4, 2017 at the Rio All-Suite Hotel in Las Vegas, Nev. Meeting details and registration information can be found at https://www.regonline.com/builder/site/Default.aspx?EventID=1851725. The Radiosurgery Society (RSS) – a non-profit, independent, multi-disciplinary organization of surgeons, radiation oncologists, physicists, and allied professionals, who are dedicated to advancing the science and clinical practice of radiosurgery. Originally formed in 2002 and becoming (501c6) in 2008, the Radiosurgery Society today (http://www.therss.org) represents over 600 members who perform stereotactic body radiotherapy and radiosurgery in hospitals and freestanding centers throughout the world.